Yzerfontein's coastline has both rocky and sandy white beaches. The "16-Mile Beach" stretches about 19 miles (!) all the way to the land mass which forms the barrier between the Langebaan lagoon and the sea (within the West Coast National Park). The coastline is washed by the cold Benguela current, so (excluding the wild and those with a wetsuit) not many people go further in than their ankles. In addition to the Sixteen mile beach, there is the beautiful and also sandy Pearl Bay just to the south of Schaap Island. The Atlantic's powerful westerly swells roll into Yzerfontein, making it a primee surfing spot. Surfing at Yzerfontein was pioneered by the likes of the legendary John Whitmore, in the 1950s. He and his cronies would spend weekends surfing at Yzerfontein (and further up the coast) and partying at the Darling Hotel. 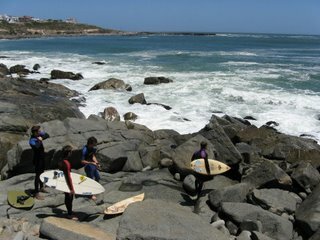 Yzerfontein's surf-break is sometimes called Schaap Eiland. The wave breaks over a flat slab of rock and then links with the sand bars onto the beach, with the result usually being a high-speed close out (under berg wind conditions the wave can hollow out).